The irrepressible Jamie Stuart is a phenomenon. This is the story of an extraordinary life that decade-by-decade since the First World War bears witness to Glasgow's people and to the ever-changing backdrop of history. 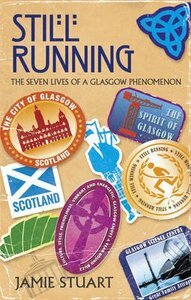 Above all, this is the story of the spirit of Glasgow through the long life of a man who rose above his 'sair daunts' to reach out and inspire many thousands of people across Glasgow, the whole of Scotland and right across the Atlantic. Author of the much-loved and widely acclaimed bestseller A Glasgow Bible, this energetic nonagenarian is an unstoppable busy public speaker, always in demand across Scotland to talk about his life and to read from the Bible - as translated into the Glaswegian patter. A successful athlete in his younger days, Jamie has been an actor, airman, salesman and social worker. As an author, he has been amazed to find that A Glasgow Bible has been a bestseller for over 20 years. Above all, he is an evangelist, bringing his Christian faith into his work and inspiring those around him. He has inspired many, many thousands - and this is the story of the deep well-spring of that inspiration.In Still Running, one of Saint Andrew Press's most successful authors, Jamie Stuart launches this book in the year of Saint Andrew Press's 60th anniversary and tells the story of his life. In the process, he inspires readers with his indomitable Christian faith and his unfailing sense of humour. Jamie Stuart has had a varied career, as a gents' outfitter, a professional actor, vacuum-cleaner salesman and a writer. He lives in Glasgow, Scotland.